Sponsors of this weekend’s Mothman Pageant included, top left, Siders Jewelers, represented by Deloris Blake and JoAnne Siders, sponsor of Jr. Royalty crowns (10 year sponsor); top right, Handley Law Office represented by Tanya Handley, sponsor of Teen & Miss Princess sashes; middle left, Peoples Bank, represented by Valerie Johnson, Brittany Burnett, and Roxanne Weaver, Teen & Miss crown sponsor (10 year sponsor); middle right, Deal Funeral Home, represented by David Deal, owner, sponsor of Ms. & Mrs. sashes (10 year sponsor); bottom left, Bravo Company, represented by Paul Simon, Ms. & Mrs. crown sponsor; bottom right, Jon Parrack Nationwide Insurance, represented by Jay Parrack, sponsor of Teen Miss & Miss sashes (10 year sponsor). Pageant Director Delyssa Edwards is also pictured in the collage. 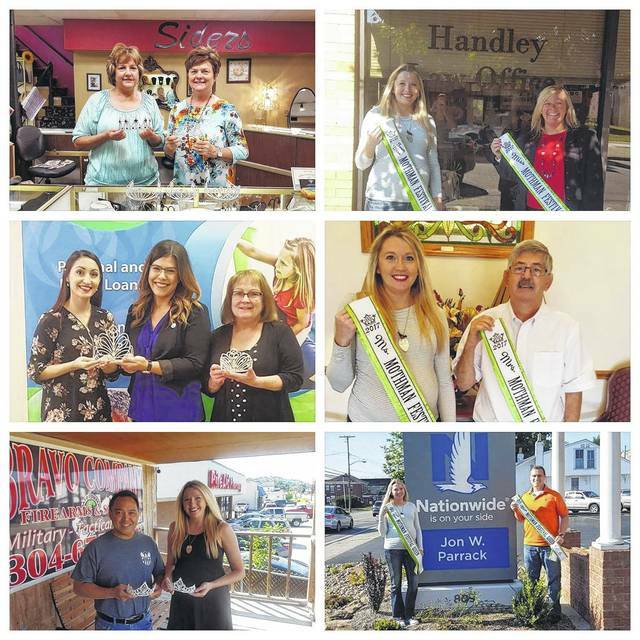 https://www.mydailytribune.com/wp-content/uploads/sites/42/2017/09/web1_9.12-Moth-Sponsors.jpgSponsors of this weekend’s Mothman Pageant included, top left, Siders Jewelers, represented by Deloris Blake and JoAnne Siders, sponsor of Jr. Royalty crowns (10 year sponsor); top right, Handley Law Office represented by Tanya Handley, sponsor of Teen & Miss Princess sashes; middle left, Peoples Bank, represented by Valerie Johnson, Brittany Burnett, and Roxanne Weaver, Teen & Miss crown sponsor (10 year sponsor); middle right, Deal Funeral Home, represented by David Deal, owner, sponsor of Ms. & Mrs. sashes (10 year sponsor); bottom left, Bravo Company, represented by Paul Simon, Ms. & Mrs. crown sponsor; bottom right, Jon Parrack Nationwide Insurance, represented by Jay Parrack, sponsor of Teen Miss & Miss sashes (10 year sponsor). Pageant Director Delyssa Edwards is also pictured in the collage.